Tammie Lister is a theme wrangler with Automattic. Before moving there focus on themes, she was focused on creating sites with BuddyPress. She’s a contributor to the BuddyPress project having worked on the UI refresh and most recently the template pack. 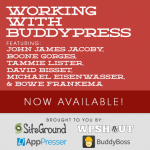 Tammie has also written a book on BuddyPress theme development. Themes are her world and she is passionate about raising the standard of BuddyPress themes.